Ya Xin who has very high self-esteem is too embarrassed to put up at the house of Qi Lei, and originally intended to take his baggage away, but coincidentally meets with parents of Yang Guang again, and is mocked and gibed by them. He left without even taking his luggage. In addition, all his friends have been instructed by Geng’s father to stop helping him. The next day, the hungry Ya Xin returns to Qi Lei’s home. Yang Guang is at easy after seeing Ya Xin again, and serves him food. Qi Baby cannot bear the sight of Ya Xin who is already fallen from the grace but still want to have own pride and the attitude of continuing to dictate Young Kwang, warning Ya Xin that the day is the birthday of Yang Kwang, and the food is prepared for her. Ya Xin feels sorry that he just care of his own problem and forgets about Yang Guang. Ya Xin asks Yang Guang’s parents to sell away his branded clothes and watches to get some cash. But Ya Xin who can’t get rid of his habit of luxury lifestyle, spend all his money to buy expensive branded accessories to give Yang Guang in order to express the importance of Yang Guang to him. Unexpectedly the gift no only does not win the favor of Yang Guang, but in turn have been reprimanded by Yang Kwang. Yang Kwang brings along Ya Xin to return the gift, and helps him to find a rented place, hopes that Ya Xin can have a “home,” can rebound, but Ya Xin always been haunted by self esteem, so he he blurts out to Yang Guang not to bother his matters. Yang Guang cannot bear that Ya Xin couldn’t see the fact, and leaves angrily. 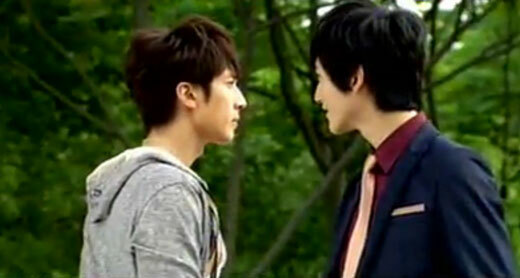 Ya Xin is regretted for his action, and wants to do something to prove to Yang Guang that he can rebound. Ya Xin thinks of a way to cheer up, he finds Ai Ying Shan, wants him to use his authority to help him takes out the stock of Li Gui Wei Er, and then sell the stocks at cheap price, on the one hand they can earn cash, and on the other hand they can hit the sales of authentic products by Alorvela. Ya Xin returns the money paid by Yang Guang to rent the house, and tells Yang Guang that he will regain Alorvela in the near future. Yang Guang who has no knowledge about it thought Ya Xin has put down the past and stand up again, not knowing that Ya Xin has chosen a dangerous path to go.